Immigrants are among America’s greatest strengths, and this holds true not just for people. Many of our major food plants—wheat, soybeans, rice, potatoes, and others—originated outside North America. And so do many of our beneficial insects. Colonists from England brought in our most valuable and well-known bee for making honey and pollinating crops, Apis mellifera. 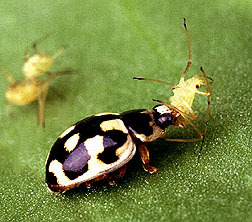 Other six-legged immigrants include some species of lady beetles that give farmers biological options to insecticides. New information suggests that several non-native lady beetles arrived in a time-honored immigrant fashion—by boat—says Agricultural Research Service entomologist William H. Day. But most non-native biocontrols are here by invitation. “USDA scientists have gone overseas for more than 100 years to search for, test, import, rear, release, and evaluate exotic beneficial lady beetles, parasitic wasps, other insects, and microorganisms. It usually takes several years for an imported beneficial organism to build up enough in number to reduce pests,” says Day, who is located at the ARS Beneficial Insects Introduction Research Laboratory in Newark, Delaware. Biocontrol species discovered and imported by ARS reduce damage by many pests, such as gypsy moths and sugarcane borers, and weeds such as water hyacinth. A P-14 lady beetle devours a pea aphid. Some successes have been dramatic, including substantial control of at least five insect pests (cereal leaf beetle, Rhodesgrass mealybug, pea aphid, alfalfa blotch leafminer, alfalfa weevil) and three weeds (Klamath weed, alligatorweed, puncturevine). The agency has estimated that biocontrol of these eight pests is worth over $250 million a year to farmers. One modern spur to biocontrol efforts was the discovery, in the 1960’s, that milk from some cows contained insecticide used against alfalfa weevils. This accelerated anti-weevil biocontrol efforts already under way by Day and colleagues. In the 1960’s and 1970’s, the scientists released about a dozen weevil biocontrols, mostly parasitic wasps. Roughly half the insects became established. In New Jersey, in a pattern later repeated elsewhere, the proportion of alfalfa growers spraying weevil insecticide tumbled from 93 to 7 percent by the early 1970’s. Around 1980, USDA’s Animal and Plant Health Inspection Service (APHIS) began releasing the parasites nationally. Within a decade, biocontrol was saving alfalfa growers $88 million a year. Today, most biocontrol imports are parasites that spend part of their life cycles inside a host—usually one or a few species of pests. Predators, however, devour their prey directly, and most are less picky about what’s on the menu. 14-spot lady beetles look for aphids on a fava bean leaf. One of the most successful non-native predators is Coccinella septempunctata, the seven-spotted lady beetle. Imported and released as early as 1959, it now occurs throughout the United States, eating pea aphids, apple aphids, cereal aphids, greenbugs, and other pests. The “seven-spot” and five other exotic lady beetles have made the Eastern United States their adoptive home since 1912, most since the 1960’s, Day says. 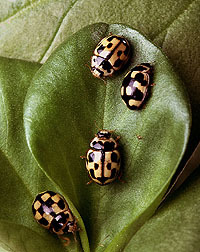 The five are Propylea quatuordecimpunctata, Coccinella undecimpunctata, Hippodamia variegata, Harmonia quadripunctata, and H. axyridis. Though scientists released some of these species, including the “seven-spot,” Day says evidence indicates all six first became established from insects that arrived on their own. He drew this conclusion by comparing records of the beetles’ first collections to prior releases, if any, in nearby counties and states. He compiled and analyzed records gathered by cooperators with ARS, APHIS, the New Jersey Department of Agriculture, and University of Connecticut Cooperative Extension. “All six species were first found close to seaports or shipping lanes near Quebec City, Montreal, Boston, New York City, or New Orleans,” he says, noting that none had previously been released in the area where it was first discovered. The records show the insects’ descendants fanned out from port areas, he says. Scientists verify beetle species with microscope. In the 1960’s, says Day, P-14’s probably jumped ship in Canada along the St. Lawrence River. The first specimens turned up in 1968 near the city of Quebec, and then the insects dispersed southward. But now, says Day, “we’ve found P-14’s in 86 new counties and 6 new states just since 1988. They’re in every New England state and in New York, New Jersey, and Pennsylvania. This is encouraging for farmers and gardeners who contend with aphids on fruits, vegetables, and other crops.” He and others have collected P-14’s from an array of trees and weeds--as well as from alfalfa, broccoli, cabbages, sweet corn, raspberries, blueberries, euonymus, tomatoes, vetch, and clover. Several ships have likely departed for America with P-14’s aboard, he says. At least one band of these lady beetle colonists was hardy and lucky enough to survive and reproduce. Day says their odds improved after 1959. That’s when the St. Lawrence Seaway opened, linking the Atlantic to inland ports as far as 2,000 miles west on Lake Superior. Port inspections intercept pests trying to hitch a ride with cargo. But insects that fly ashore from ships on inland waterways would escape detection. Day says foreign-born lady beetles could find shelter in or on cargo containers or shipboard structures with protective nooks and crannies. And compared to urbanized coastal ports, lady beetles leaving a ship on an inland channel would stand a better chance of finding aphids nearby in farms and forests. 14-spot beetle and pea aphids. Factors that favored P-14’s progress in the Northeast could also help it gain a foothold in the West. There, scientists have released it, but with little success so far, says David Prokrym of APHIS. He collaborated with Day in analyzing the beetle collection records. In Niles, Michigan, Prokrym coordinates APHIS’ biocontrol project aimed at Russian wheat aphids. These leaf-sucking pests invaded around 1986. They now infest wheat and barley in 17 Great Plains and western states. Growers annually pay a multimillion-dollar tab for aphid-related yield loss and insecticides. From 1987 to 1993, APHIS released 591,000 lab-reared P-14’s in 16 Western States. Surveys have not detected any established populations. The Northeast is more moist, has more plant and habitat diversity, and has smaller farms than the Great Plains. There, wheat may span the horizon. Or fields may be left fallow for a year after harvest, to conserve soil moisture. Some mystery shrouds H. axyridis, an Asian lady beetle that now thrives in the United States. In recent years it has set up homes in the East, South, and Northwest. Day concludes, from collection records, that this beetle first became established from ancestors that entered by ship at the ports of New Orleans and Seattle. The beetle apparently failed to adapt after releases in California in 1916 and the mid-1960’s, says entomologist Paul Schaefer at ARS’ Newark lab. In the late 1970’s, he collected about 700 H. axyridis in Japan and shipped them to Newark. The lab supplied beetles to other researchers, though chiefly to entomologist Louis Tedders at ARS’ Southeastern Fruit and Tree Nut Research Laboratory in Byron, Georgia. From 1978 to 1981, Tedders reared and released 88,000 H. axyridis in a pecan orchard used for research at Byron. About that time, others released the beetles in the South, East, and Northwest, but again they seemed to vanish. That summer, however, Louisiana State University scientists found the first established U.S. populations in Abita Springs, Louisiana. It is hundreds of miles from areas where H. axyridis had previously been released—but only a few miles from New Orleans. This lady beetle also is common in western Washington, especially near Puget Sound, an inlet used by ships headed to the ports of Seattle and Tacoma. But it wasn’t seen until 1994 in the region of Washington east of the Cascade Mountains, where ARS scientists released it in 1981 and 1982. 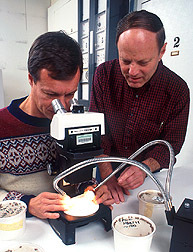 Tedders examines lady beetles collected from silo. “Where present,” Tedders says, “H. axyridis has nearly eliminated pecan aphids. Some growers have tended to spray instead of letting a natural control take its course. But now, I know a lot of pecan growers who wouldn’t even think of spraying. A biological standout in many ways, H. axyridis has a wider range of colors and spot numbers than other lady beetles. Wings range from black to mustard; spots number zero to many. The most common United States form is mustard to red with 16 or more black spots. But the species is easy to identify from its big false “eyes—twin white football-shaped markings behind the head. This lady beetle is also prolific: Adult beetles fed on pecan aphids in Tedders’ laboratory laid about 20 eggs a day. Barely one-quarter-inch long, the insect has a big appetite. 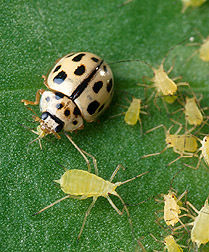 “Even before reaching adulthood, one beetle can eat 300 aphids,” Schaefer says. Its dinner menu can include more than 50 species of aphids and other soft-bodied insects that are pests of ornamental rose, crape myrtle, plum, peach, apple, magnolia, clover, cabbage, vetch, pine, tulip tree, maple, and other plants. H. axyridis dwell mainly in trees. For several days during autumn, however, they typically aggregate, or cluster, in large numbers on sunny sides of light-colored rock outcrops or structures. Nearby crevices may offer winter shelter from storms, cold, and wind. But the insects occasionally aggregate on homes and other buildings, especially those with light colors and sunny southwest exposures. Sometimes, the ladybugs use openings such as uncaulked window frames to become a crowd of uninvited guests. “This can certainly be a nuisance, but people shouldn’t be alarmed,” says Schaefer. He and Tedders advise people to avoid killing the ladybugs by spraying them with an insecticide or squashing them. Handling ladybugs or picking them off a wall causes a stress-related defensive behavior: they secrete an orange substance that, though harmless, can stain walls and fabric. Tedders and Schaefer suggest removing indoor aggregations with a vacuum cleaner with a crevice tool. The insects can be released outdoors--though in winter they may die from cold unless they soon find shelter. Another option is to do what Tedders does to keep the beetles he harvests healthy until spring. 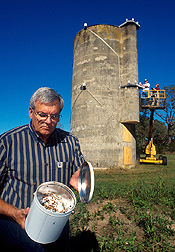 ARS employees collect containers of trapped beetles from silo. Entomologist Jeff Aldrich at ARS’ Insect Chemical Ecology Laboratory in Beltsville, Maryland, is trying to learn whether the beetles produce attractant chemicals, or pheromones, that trigger or regulate aggregation. If so, he says, this could lead to a way to attract them to suitable sites for collection or overwintering. Aggregation makes H. axyridis easy to collect for research and redistribution. Since 1992 at Byron, the ladybugs have picked a convenient site--an abandoned silo at ARS’ research farm. The silo, a tube of light gray concrete, rises 31 feet, with a diameter of about 15 feet. On warm, sunny afternoons in early November, the beetles walk on and fly about the silo’s walls. “They’re attracted to the silo,” says Tedders, “because it seems to offer shelter from the coming winter’s cold.” But since it really isn’t suitable--it doesn’t have a top to keep out rain, for example--they don’t stick around long. In 1993, scientists and technicians used soft brushes to painstakingly sweep 17,500 lady beetles from the silo into containers. For 1994’s harvest, Tedders installed beetle-corralling devices he designed. Inverted V-shaped channels made of wood slats and window screen hug the silo’s wall. When the lady beetles land on the wall, they tend to walk upwards. This takes them to the apex of the vee, where they “escape” through an opening--into a trap, a funnel leading into a container. “We collected more than 43,000 H. axyridis this way in the fall of 1994,” Tedders says. Since 1993, university scientists have released Byron’s beetles to combat pecan aphids in California, New Mexico, and Texas. “These beetles may also have potential to control aphid pests of apple, peach, and other fruit trees,” Tedders says. — By Jim De Quattro, ARS. William H. Day and Paul W. Schaefer are in USDA-ARS Beneficial Insects Introduction Research Unit, 501 S. Chapel St., Newark, DE 19713; phone (302) 731-7330, fax (302) 737-6780. W. Louis Tedders, Jr., at the USDA-ARS Southeastern Fruit and Tree Nut Research Laboratory, P.O. Box 87, Byron, GA 31008; phone (912) 956-6434, fax (912) 956-2929. Jeffrey R. Aldrich is at the USDA-ARS Insect Chemical Ecology Laboratory, 10300 Baltimore Ave., Bldg. 007, Room 326, Beltsville, MD 20705; phone (301) 504-8531, fax (301) 504-6580. "Tiny Lady Beetles Have Big Biocontrol Potential" was published in the March 1995 issue of Agricultural Research magazine. 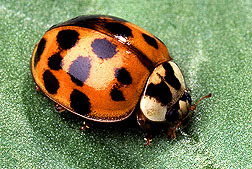 "The Multicolored Asian Lady Beetle" (ARS Fact Sheet). Lady Beetle Trap. PDF (portable document format) file with technical directions and diagrams for a trap developed by ARS scientists. Click here if you need the free Adobe Acrobat Reader for PDF files. 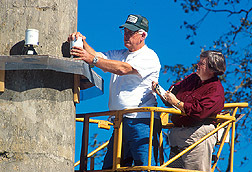 Additional information and guidance may be available from state and local Cooperative Extension system agents and scientists. Extension phone numbers are listed in local directories. On the Internet, Cooperative Extension contacts at state land-grant universities can be found by following the links at the "State Partners" page of the web site of the USDA'sCooperative State Research, Education, and Extension Service.